For years I thought this verse above meant that the more I knew the truth in the Word of God, as in memorizing scripture and reading the Bible, the freer I would be. Although, this is true, I was missing the mark on the source of freedom. I was coming at it from an academic or educational position instead of relational. "Then Jesus said to the Jews who believed Him, 'If you abide in My word, you are my disciples indeed. Then, you will know the truth and the truth shall make you free.'" The Truth isn't just something to be studied or words on a page. When we abide in "The Truth", we change from a vantage of knowledge to knowing. There are many people who diligently study the scriptures, seeking the Word of God to bring them what they desire...prosperity, health, position, or blessings. Yet, they never know the Truth. They pile on scriptures like a covering over their heart. And the very words spoken to penetrate the depths and pierce their soul, are blocked due to fear, ignorance or self-protection. The reason we study scripture isn't just to have Bible knowledge or memorize promises. The reason we read the Bible and study the Word is so we can know the person of Jesus Christ. 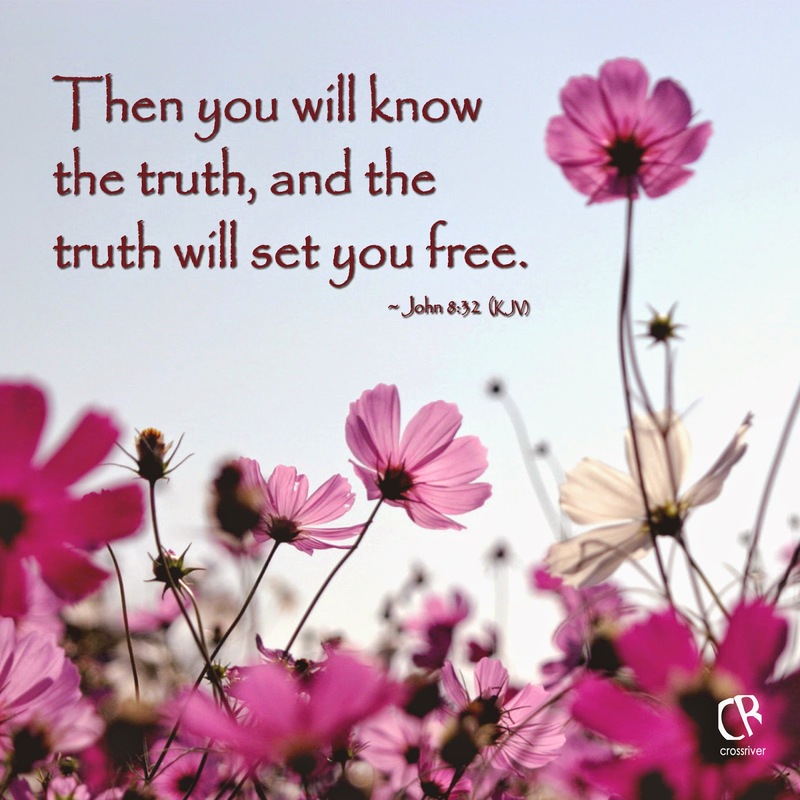 And when we KNOW the person of Jesus Christ, when we KNOW the Truth, then the Truth will set us free. He alone can set us free. He alone is worthy of all our praise. And who the Son sets free, is free indeed. Two weeks ago, Sarah and I went on a mini shopping excursion. I say "mini" because we had a limited amount of time to complete our mission of finding a couple of spring/summer dresses for her. As we parked, I explained to Sarah that we only had about an hour to look and leave. We entered through a huge department store and began meandering our way down the aisles lined with the latest fashions. My eyes kept drifting to the left and right of the walkway, drawn in by the beautiful vast array of attire. How I wanted to stop and look for myself!! Sarah noticed my wavering and encouraged me through her giggles to not get distracted. "Don't look to the left or to the right mom, look straight ahead. Stay in the middle." She was right. I needed to stay focused on the mission or we would miss what we came there to do. Her wise words reminded me of this exhortation of the Father. As we are on the mission God has assigned for us to do, distractions may come to try to get us to turn to the right or to the left to keep us from the middle of God's perfect will. We need to be alert and stay in the middle, and not be drawn to the left or right by the desires of the world around us. Our eyes can deceive us and the luxuries of this world can be enticing and seem beautiful. When we are drawn to the left or to the right, we risk missing what we are here to do. There is only one reward worth chasing...the crown of glory! These words changed my life about three years ago as I wrested with God over the new calling and gifting He was revealing to me. In 2011, I began writing and for months I struggled with whether I had any credence to be writing and who was I to think I could be used by God in this way. Who was I going to believe? Me or God. Was I going to believe my own fleshly mind filled with self-doubt? Or would I believe God. The most true thing about anything is what God says about it. Do you know what God says about you? I want to give you some verses today to look up. As you look them up, may you discover the most true thing about yourself. I have no doubt God will also put you in a position where you are forced to wrestle with your identity and choose whom you will believe...you or Him. I would love for you to come back and comment on which verse spoke to you! 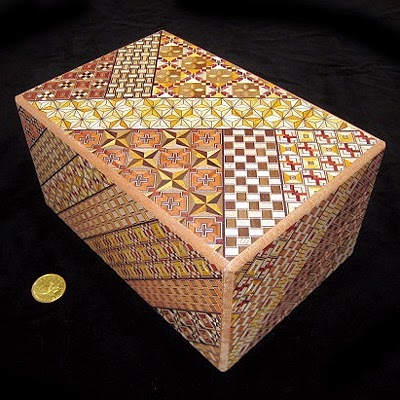 A puzzle box is a box that holds secret treasures that are hidden from sight at first glance. It is only through a series of intricate maneuvers that the contents within are unveiled. When we accepted Jesus as our Lord and Savior, we died to our old life. The old us departed and we became a new creation in Christ Jesus (2 Cor 5:17). That is, after all, what being "born again" is all about. However, we didn't become our new selves all at one time. That would be nice, but there is a transformation that is required to take place gradually over time. Just as a baby is born and is unable to walk, eat meat, or talk until it learns to do these things over time, our maturing process and growing as a Christian is reflectively similar. Yes, we are new creations, just as a baby is a new creation. And just like a baby grows and develops over time into a grown- up version of the same person, our spiritual growth in becoming all God created us to be takes time. Who we really are is hidden. Who we really are is hidden in Christ with God. God is constantly twisting and turning and maneuvering in our lives so that the real treasures hidden inside of us emerge. As we study God's Word and as we pray and grow closer to the Lord, our real life is revealed. We become different people, better people. We become more like Christ and less like our old dead selves. We become our true selves. When I rededicated my life to Christ and truly decided to follow Him, I was a tangled mess. God has taken one strand at a time to un-knot the mess I created. We cannot see the finished picture right now. Our real life, glorious life, is hidden. He is still working and I know He won't be finished with me until I meet Him face to face before His glory. The true me. I'm not there yet, but I am thankful I'm not where I was! Your real life is hidden too, and you are going to LOVE who God created you to be! Just keep walking with Him, one step at a time, and you will be amazed at the treasures inside! Father, I thank You that You have designed each of us unique and special, with certain gifts, talents and abilities. I thank You that as we grow closer to You and spend time in Your presence that we become more and more of who you created us to be, and our true identity is discovered, our identity in Christ. Lord, I ask for everyone reading today that you would reveal to them another facet of their real life that is hidden in Christ Jesus. Father, help us all to know our old life is gone and that You have a new life for us in You. We love you, and I pray we will become all you intended us to be. In Jesus' Name, Amen. Last Christmas season, I wanted to teach my three kids more about giving. So, we decided to bless three strangers at Walmart with a unexpected gift card. The four of us headed out to Walmart in our white mini-van for our mission. The kids were not very excited about it. They couldn't understand why we would just give a random person a gift card. Oh, how this lesson was so needed! In their minds, it seemed odd and besides...What would the strangers think about it? When we do something out of the norm, many people may not understand. But, not understanding doesn't negate the purpose or effectiveness. Nothing is normal until it becomes the norm. We bought our gift cards and we looked to see who our first recipient would be. I have to tell you all three reactions were completely different and it was very interesting to observe people's reactions. The first lady was thankful, but was going to refuse the gift card. She said that someone else needed it more than she did. The second lady was extremely thankful and even ran up to us again and hugged me with tears in her eyes and said, "Thank you so much. This was such a blessing!" The third person looked confused and didn't quite seem to understand what was happening. This person was baffled why anyone would just give them something. These three very different reactions reminded me of how often we view blessings from the Lord, or even how some perceive the gospel of Christ. People may react in one of these three ways when hearing the message of the gospel or in response to God's blessings in their lives. 1. "Someone else needs this blessing more than I do." This can be false humility. Maybe someone does need it more than you, but if God is giving it to you, receive it! I didn't share the end of what happened with the first lady. I have to say that it did not bless me for her to decline. It almost offended me. I insisted she keep it, and that it was hers to do whatever she wished with and that if she didn't want to keep it, she could pass it on and bless someone else with it. Receive His blessings and then ask how He would have you bless others. But please don't decline what the Lord gives you. 2. True Thankfulness and Response. The second reaction is the one I think blesses the Lord the most! It blessed us the most! This lady was truly thankful and openly showed her thankfulness! 3. "I don't deserve blessings." The third person didn't know how to respond to this free gift. I think they thought surely this isn't free, nothing is ever free. It seemed they had lived a hard life and could not understand why someone would just be kind to them. Jesus came and died to give us the free gift of salvation, there is nothing we can do to earn this gift. No, we don't deserve it, but God loved us so much that He paid a hefty price so we could receive this gift. Again, like lady #2, true thankfulness and gratitude with proper humility is the appropriate response to every gift the Lord gives. My kids also learned a good lesson through this experiment/mission. They learned that giving is fun and they too were the most blessed with the response of lady #2. May we all respond like lady #2 to everything the Lord desires to give us...with an open heart and thankfulness! My daughter and I parked the cart over by the side of the rack and began looking at the cute beach towels. Suddenly, I heard a crash and glanced as I saw a man ram a cart into the display and mutter something about people parking their carts in the aisle and how rude that is. Well, I was able to just "let it go" and go on with a rather enjoyable Walmart experience. Then, I got in line at the checkout counter. As I was placing my items on the conveyor belt, I noticed some unpleasantness going on behind me in line. There were 3 ladies behind me and apparently one of them had "cut" in front of the other by positioning herself to the side and in front of her like she was charging ahead for the finish of the Kentucky Derby. I had to laugh to myself. However, the lady behind the eager race horse did not find the whole scenario quite as humorous. She did try to be gracious and told the lady to go ahead and that she could see she was obviously in a hurry. The race horse said, "Ok" and began placing her items behind mine on the belt. Well, the lady behind her could not contain herself any longer and began to inform the lady about how rude she was being, to which, the lady had no response. She just continued placing items on the belt and then she stood right where I needed to stand to pay. Still amused by the fiasco, I politely told the lady I still needed to pay and asked her if she could move back. She did...for about 2 minutes, and then stepped back to where I needed to stand. Well, the cashier was done ringing up my items by this time. So, I smiled and laughed and told the lady I needed to get to that spot to pay, unless of course, she wanted to pay for my items. She smiled and laughed too and something changed. I think something happened in her when I reacted in kindness and even humor to this tense situation. She immediately had a change of heart and suddenly this race horse that was in such a hurry, backed up, pushed her groceries to the back of the belt and insisted that the lady behind her go first. A spiritual mentor of mine, Karen Ellison, the founder of Deeper Still Ministry, talks about reacting to people in the opposite spirit. It is the same principle as blessing those who curse you. When you are kind to those who are unkind or rude to you, something happens in the spiritual realm that we cannot see. It disarms the forces that are at work to tempt us into sin. I could have easily gotten offended and irritated at that lady for continuing to act impatient and being where I needed to stand. And, many times in the past, I haven't responded in love like I should have. However, this day I did and I saw the result! Sometimes we may not see the result, but we just need to know that God is working even if we don't see it.